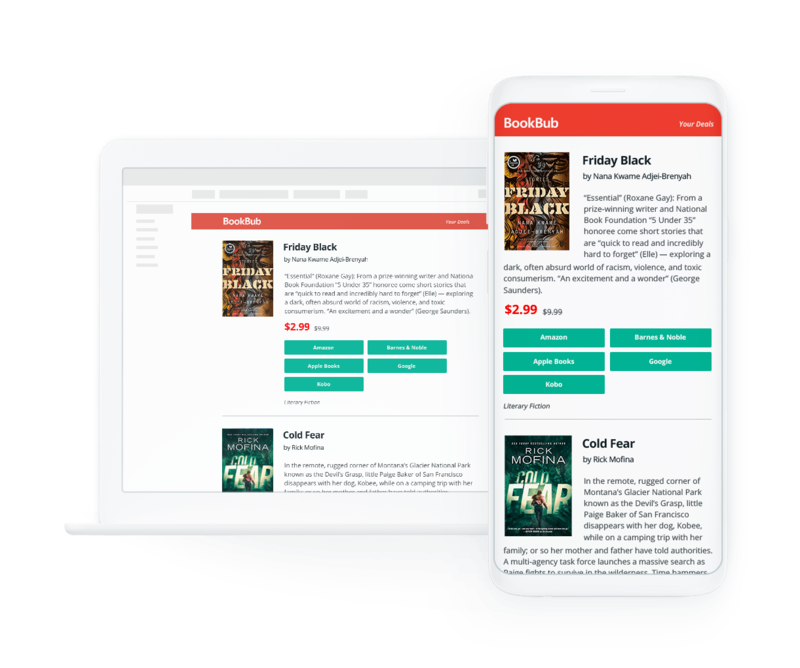 BookBub emails millions of readers each day with a curated list of discounted ebooks targeted by category. Our team of editors picks each day’s Featured Deals from hundreds of partner submissions, ensuring we only feature great deals on quality ebooks. Why run a Featured Deal? Partners see an average 196x increase in earnings from a book during a Featured Deal. 95% of BookBub’s readers discover new authors through price promotions and 70% of authors report an increase in sales of their other books after running a Featured Deal. The high volume of sales from a Featured Deal can boost an ebook’s visibility on retailer bestseller lists, driving additional sales from readers who aren’t subscribed to BookBub. Hundreds of books hit the New York Times and other bestseller lists each year after their features. After each Featured Deal, we email any readers who clicked on the book to encourage them to follow the author. Retarget any readers who clicked on your Featured Deal with BookBub Ads campaigns in the future. Create a BookBub Partners account and submit an upcoming ebook discount for consideration via the Partner Dashboard. You coordinate the discount on any retailers you’re including in your deal. Once we confirm the book is discounted on your feature date, we’ll email it to our readers to download and enjoy!